The vegan fairy tale of a rancher’s wife that started naming and loving the cows they were sending to slaughter is anything but a non-fiction fantasy. It’s been a joyride, a psychological thriller and one of the most edgy transitions that I’ve ever made in the span of my almost 59 years on this planet. Who would have ever thought that a multi-generational Texas Rancher would start eating plants and liked the way he felt so much that he stopped eating meat. I was the rancher’s wife that went vegan and I was indoctrinating him with every plant based documentary I could find because the word vegan would turn him off every time. On a mission, I persisted. When I stumbled upon Forks Over Knives, that’s all it took. The China Study along with So Delicious Ice Cream finally took him over that edge, and together we awoke to a way of thinking and being that is changing hearts and minds across the world. Tommy lost 40 pounds and his activism is profoundly touching the lives of everyday farmers, ranchers and good ole boys in our Brazoria County, Texas backdrop. On Oct 31, 2014, I went vegan. The moment that I slipped down the “rabbit hole” of no return is palpable. To say, I’m forever changed by my decision to forego my loyalty to my husband’s heritage, in favor of the compassion and utter revulsion I was now having at this juncture is a lukewarm descriptive. No one on the planet that I know of has ever done such a thing—and if they have—come forward, we need to talk! This month marks my two-year vegan anniversary and I recall with detail, my feelings, rants, joys and obstacles that I encountered as I began to navigate a territory in my mind that had never been explored. I felt like a pioneer on unnavigated terrain, and I was. There’s a quote I recall from the Bible (John 14:2) that says; “In my Father’s house are many mansions. And if not so, would I have told you that I go to prepare a place for you”? Whether you are a Christian, Buddhist, Muslim, Taoist, Hindu or Atheist is not relevant. Divinity shows up in our humanity when we are ready to step into our calling and be the voice for our purpose instead of a voice for ourselves, our little plans and designs. When I took that step, I landed in a house I had never known, and it was all just a thought away. Being married to my husband that I love and respect dearly is what catapulted me over the rainbow that landed me slap, dab in the middle of “true love”! The “end of the rainbow” I was always looking for but never able to find was veganism. I had found my mansion. When my husband and I remarried for the 2nd time, I was a top producing realtor in a prominent subdivision in Pearland, Texas. I was an expert buyer’s agent in a 4000-acre master planned community, and I thought I had “arrived.” Earning a 6-figure income was easy—I had found my financial niche in the world and Tommy and I were ready to bring our lives back together again for the 2nd time. He had acquired a 96-acre beef cattle ranch 40 miles southwest of Shadow Creek Ranch, and I was living in a 3500-sq. foot home in one of the most prestigious areas of the development. I was sharing space with my broker and friend Sherry, saving money to build my own home in Shadow Creek. The tug of war began. Tommy wanted me to move to the ranch and I wanted him to sell out and move to Pearland. He wasn’t having it. The thought of living in an upscale subdivision made him cringe. His remedy was for us to have two homes but I couldn’t stand the thought of that, so after much deliberation I relented and moved to the ranch. If you’ve ever heard of “Green Acres,” then you might get a visual and a feeling of how I felt when my high heel pumps and 3-piece suits moved in with Tommy and the cows. There was a rocky driveway that broke my heels and after a couple months it was obvious that I was not going to be working as a realtor in Pearland. The ranch sucked me in. I was used to slick concrete driveways, a reason to wear a $200 suit and a clean, shiny sedan—I had a Buick Enclave at the time, and it was spotless. There was no reason for any of that at the ranch, so I found myself wearing mud boots, jeans—and my Buick, well I sold it and bought a bright yellow Volkswagen. Backtracking here is relevant for you to know that I spent the better part of half my life as a practicing yogini and yoga teacher. I had perfected the art of yoga, meditation and observation. The story of how and when I became a yoga teacher and holistic wellness practitioner is a story for another article but suffice it to say, I’m an avid student and teacher and have spent about 30 years of my life steeped in the Yogic and Ayurvedic traditions. Ten day silent retreats at yoga ashrams were my holiday—yes, I revel in silence. Having said that, I began to notice with deep reverence the cows—where before I had ignored them. Their presence was always obvious but my connection to them as beings worthy of my love and respect was void. My yogic mind was exploring and observing in the background of my awareness. Behind the scenes of my constructed reality, another reality began to emerge. Scenes of cows and their babies forever free—relaxed—content and loved, started playing—and it wouldn’t stop. I found myself going in and out of conscious awareness. One aspect of my mind knew that I had to be a loyal rancher’s wife, and endure the suffering I experienced when the babies went to the sale barn to be sold for slaughter—I had to be tough. The other facet of my sensibilities didn’t know how I could ever endure such a life. I found myself falling in love with these sentient beings, and in this house that “my Father” created, there was only love—slaughterhouses didn’t exist. Knowing the cows were there and caring about them were two entirely different things. At the onset, I was very resistant to being a “rancher’s wife.” I abhorred opening gates. Stepping in cow poop was not fun, and for some reason I couldn’t bear to look the cows in the eyes. I avoided every task that had anything to do with caring for the cows. I didn’t know then that the reason I was so resistant was because of the “disconnect.” Some folks can live their whole life raising, feeding and then slaughtering these conscious beings without remorse because “it’s the way things have always been done.” My husband was like that. It was family tradition and it was his heritage. His grandfather and great grandfather had been ranchers. Their ranching legacy dates to the late 1800s where his great grandpa used to drive “cattle” from the open ranges in San Antonio, Texas all the way to Houston, where he owned a large meat packing plant, aka, a slaughter house. Tommy had it in his mind that he was going to turn me into a good “rancher’s wife.” He wanted my participation and he got it when he told me about a 2-month-old calf that didn’t have a momma and asked me if I wanted to buy her and care for her—that calf was Rowdy Girl. She is the reason that my heart opened and my soul expanded to grasp the sacred ground of the bovine message so that I could be a conduit for their story. Figuratively, I went from Eva Gabor to Elly Mae Clampett the day Rowdy Girl became my daughter. She opened the forbidden portal and where there was once cognitive dissonance, there was now profound and innocent love for all of them. My entire being resonated to the sound of their heartbeat. For the first time, their eyes met mine, and I did not look away – I welcomed their sentience and my spirit merged with their calling. At that moment, their voice became my own. Bottle feeding Rowdy Girl gave me entrance to the mothers in the pasture where they too were feeding their babies. Tears well up and deep grief overtakes me as I envision those mommas and babies that were betrayed by us for 6 years! It took me 6 years to break the looking glass that I had been trained to see through. The reality beyond the veil is veganism—and it is a life that has always been here waiting on me to wake up to their suffering and my ignorance. But waking up means shaking up years of belief systems that were never my own. I really love these animals now. I see their soul and they see mine. I’ve named every one of them and they know who they are when they are with me. They know they can lay down with me in the pastures—that they can extend their necks for an affectionate and very intimate neck rub. They know they can lay their head in my lap, and I know that I can lean on them, lay back and rest on their bosom. They know they are loved and they respond in kind. They are the perfect dancing, yoga and meditation partners. Singing to them, doing tree pose in their midst, and chanting while they chew their cud is a vegan treasure trove of sacred experiences. How did we ever think that loading up the babies and taking them to the sale barn was ever “the right thing to do”? How did we ever think that the wailing grief of all those momma’s crying for their stolen babies was “normal”? How did we ever think that raising cows and breeding them for profit was a respectable business when we knew, whether we thought about it or not, that their life was never their own and that what we were, was slave owners. Slavery has been transposed to modern-day animal agriculture. That evening, I went to my mother-in-law’s house for a Halloween get together with the family. Every Halloween we would go to her house, watch the parade with all the kids dressed in their costumes and begging for candy. Tommy’s sister, brother-in-law, nephews, nieces and their small children were always there and it was a joyous occasion. That evening, my mother-in-law was serving “beef stew”! I didn’t see meat; I saw floating hacked up dead animal parts. For the first time in my life I called it out on the carpet, and at that moment, I’ve never looked back. The family was silenced by my bold declaration that there was “floating, dead, hacked up, animal parts” in the bowl. They looked at me in disbelief as if I had spoken an unpardonable sin. And, then I was told that I could “pick it out”; but, there was no more “picking it out” for me. Everyone resumed their jovial discussion and I went further down the rabbit hole, and forever lost my way back to a belief system where we can love one animal but eat another. 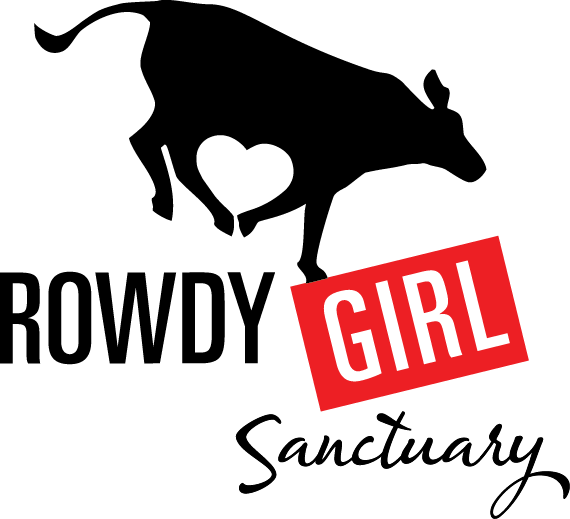 That, was almost two years ago, and as I reflect on the inception of my journey as a rancher’s wife gone vegan, to the founder of Rowdy Girl Sanctuary, I am indeed honored, humbled, and deeply grateful for this revolution. Tommy and I almost divorced over this; my inability to withstand his way of life threatened everything about him! It is a miracle our marriage survived. Today, he works 10-12 hours/day, almost every day at the sanctuary, and now he’s vegan too. There’s another Bible verse that comes to my mind (1 Corinthians 3:15) “If any man’s work shall be burned, he shall suffer loss; but he himself shall be saved; yet so as by fire.” My revolt tested every fiber of his being, but we escaped the flames together, and we are on the other side. Our relationship is very different. Today, I love opening gates, and not only do I step in cow poop, I clean it up. I love how nature has intervened and created a haven of refuge for not only these farm animals but also for all the people that are coming from all over to experience first-hand the depth and the beauty of these perceptive beings. Sanctuary was here the whole time. The only thing that changed was my mind. And now, nothing is the same. There’s a Rowdy Girl and a Rowdy Guy in all of us—it’s time to get rowdy for the animals!